©2015 Daniel Lawless. All Rights Reserved. 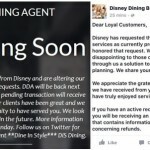 The Hub is all about D23…or at least the parts we want to discuss. To join us in this discussion, we bring on Zeke and Rachel from the Behind the Magic Podcast (www.btmpodcast.com). It is always pleasure to chat with them both on-air and off-air. This discussion talks about the Stars Wars announcements that came from D23 2015. We talk about the movie, the proposed land for Disney’s Hollywood Studios, video games, and much, much more. We reference the following websites’ articles. How did you feel about the Star Wars announcements from D23 2015? What did you think about it? Any comments? 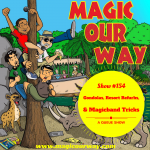 Share them at magicourway@gmail.com. In the Queue, we talk about Hurricane Danny to see what he is up to. Also, we discuss the Garden Grill’s new offering of breakfast and lunch, much to Kevin’s delight. In Guest Services, we recognize one of Kevin’s former students, Chase Ledet, who is currently part of the Walt Disney World College Program for Fall 2015. Follow his adventures through the Walt Disney World College Program on his blog, http://chasemledet.weebly.com/blog. We also hold out a comforting hand to one of our own, Dr. MoWHOcan. As always, we promise to give the Disney fan a voice and this show is no exception! If you have any thoughts, please send them over. If you want to make a custom show intro or a Show ID and and want to be forever immortalized on MOW, send that in too. Thanks again for listening to us. We do realize that you have many choices when it comes to Disney podcasts and we appreciate your attention. 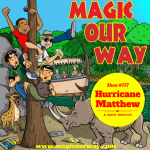 The Magic Our Way Podcast love to interact with our fans and fellow podcasters.